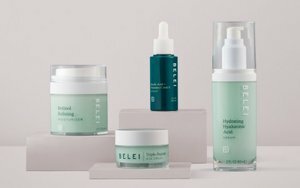 As evidence emerges that competitors are closing in on Amazon faster than expected, the ecommerce giant is launching Belei, its first dedicated skincare line. The beauty industry has been chewing its fingernails over what the expected Amazon incursion may mean for other brands. And earlier this year, Amazon launched a makeup brand called Find, available in the U.K. The 12 Belei products, which include moisturizers, masques, serums and eye cream, are priced between $9 and $40. Featuring some of the buzziest ingredients — peptides, retinol, Vitamin C — they seem competitive not just with drugstore brands like Neutrogena, ROC and Olay, but higher-end lines as well. And they bump right up against Glossier, currently the hottest online beauty name. Amazon says Belei is free of parabens, phthalates, sulfates and fragrances, that bottles are made of post-consumer recycled resin and that its packaging is fully recyclable. Products were not tested on animals. Amazon’s reach and dominance are still massive. But it appears other retailers, including Kroger and Walmart, are doing better in the battle against Amazon that many might think, as their own CPG ecommerce operations strengthen. New research from Nielsen, powered by Rakuten Intelligence, shows Amazon’s dominance in digital sales of CPG products is slipping. Walmart, Kroger and Target have all increased their online customer base by at least 90% more than Amazon in the past two years. Nielsen says the gains are coming from effective click-and-carry models, which increased from 4% to 11% of all CPG ecommerce sales in the two-year period. And online CPG sales have gained 30% year over year, with 60% of shoppers browsing and ordering online. Some 28% have purchased CPG online a few times per month. Growth is a bit slower in the beauty business, with Internet Retailer reporting an annual category gain of almost 24% and $5 billion in sales. While the online beauty business is also a key focus for retailers like Walgreens, CVS and Rite Aid and specialty chains Sephora and Ulta, some beauty brands are soaring with direct-to-consumer offers. Forbes recently named Kylie Jenner, owner of Kylie Cosmetics, the world’s youngest self-made billionaire. And Glossier, for example, just announced another $100 million in funding, pushing its market valuation past $1 billion.